Market transition theory has developed ever more nuanced methodologies for the analysis of institutional change in an economy at meso- and microlevels of analysis. Relying on several of these contemporary analytical methods, this paper will discuss obstacles to, and suggest preliminarily some theoretical and empirical approaches to the study of, the extent of causal influence of levels of sectoral integration on market transitions. This will be undertaken with reference to the interaction in Cuba of (1) tightly-structured, exclusive, and corporatized military-run enterprises with (2) more loosely-bound managerial and entrepreneurial networks in foreign investment and trade sectors and (3) relatively tenuous social and economic networks tracing the outlines of the second economy. Specifically, an examination of incentive structures and operative rules affecting integration or synchronization across these economic sectors will suggest that there are major, and persistent, constraints against a significant transition to the market. From an institutional perspective, economic development depends on integrative institutional linkages functioning in such a way that growth in one sector impels growth in other sectors. At times working at cross-purposes, since the mid- to late nineties, the Cuban government has promoted tourism, export, and foreign investment while severely limiting the development of financial and information infrastructures, and it has allowed very differently endowed military- and civilian-managed enterprises to advance in parallel. In short, it has taken contradictory policy initiatives that would appear to stymie the stated goals of economic restructuring, if only because of the severe disarticulation of the economy. One scenario for market liberalization in Cuba might be that the eventual “thickening” of markets in either the second economy or in sectors open to the global economy will outweigh the distorting influences of military-run and other state-run enterprises. Of particular interest would be identification of enabling conditions which might “tip” the organization, membership, and functioning of firms in these economic sectors in a market direction. However, this study will concentrate on questioning the extent of enabling conditions for marketization, particularly the lack of market coordination mechanisms—such as factor markets—across economic sectors. Put another way, Cuba does not meet the criteria of an “emerging market economy” (EME), nor is in prospect of doing so, if an EME is defined by the acceleration of economic development through (1) policy mechanisms favoring economic liberalization and (2) the creation of institutions of law favoring a free and adequately integrated market such as property rights, contract protections, and employment laws favoring independent contracting of labor (Hoskisson, et al., 2000). In a much-studied process which has received extensive attention in ASCE works and elsewhere, the Cuban government began in 1993 to introduce limited measures toward economic liberalization, legalizing certain kinds of foreign investment, joint venture, and private microenterprise, as well as legalizing the dollar. It thus sought to create demand abroad for Cuban products and Cuban tourism, and generally to obtain hard currency, while attending to growing domestic demand that far outstrips an increasingly marginal rationing system. By the end of the 1990s, if its claims are accepted, many of these economic tactics had worked for the regime, if only to the point of bringing Cuba out of extreme economic recession and “reinserting” it, though precariously, in the global economy. There is no evidence, however, that these measures amount to a fundamental movement toward economic restructuring. To the contrary, the testimony of the Cuban leadership, notably Fidel Castro’s, plainly exhibits a deep-seated antagonism toward profound, expansive, or enduring economic reform. Three of the market-pegged devices which may have had the greatest impact are interrelated, and all betray serious limitations owing to institutional insufficiencies, as well as to self-defeating policy mechanisms that are conditioned by the imperatives of central control. These are: (1) the development and vigorous implementation of varied forms of joint ventures with foreign investors in key sectors such as tourism and telecommunications, often under the managerial direction of the military (the Revolutionary Armed Forces and the Union of Military Industries); (2) the creation of cadres of entrepreneurial managers made responsible for generating business for firms in tourism and other sectors, especially hard-currency foreign investment (reportedly with a 70 percent to 30 percent overall split between civilian and military managers); and (3) the development in various ministries of novel ways to promote Cuban exports, from tourism to cigars, sugar, nickel, and biotechnology, an endeavor tied in part to global marketing strategies relying on the Internet and World Wide Web. However, the unpredictability of applicable rules—their frequent modification in the foreign investment type of venture, as in the “own account” sector—has produced or exacerbated market segmentation. Market coordination—i.e., the synchronization of information exchange and transaction streams across market sectors—is thereby significantly impeded. Without a loosening of political control, Cuba cannot enjoy the movement found in other developing nations toward supply, subcontracting, financing, production, and marketing networks, nor toward the expansion of market intermediation, e.g., of factor markets in the distribution and reselling of finished products or in the contracting of labor. Central economic controls preclude the self-organizing development of markets and limit the reach and effectiveness of manufacturing, extractive industry, export, foreign investment, tourism, and service sector initiatives. While state agencies are being turned into corporate and joint stock enterprises, the persistence of subsidies, the privileged economic role of the military, and the growing leverage of foreign investors make for a significant distance between unequally-endowed enterprise sectors. The pervasive compartmentalization of economic actors and sectors precludes the generative tension between the second and formal economies that can arise in late state socialism (Gábor, 1994). Banking is similarly compartmentalized or segmented, under the purview of the state as owner, regulator, provider, and borrower, with insufficient controls and insufficient flexibility to respond to capital needs in domestic markets. There is a problematic assumption in the literature on the Cuban transition of a dynamic linkage between the second, or “own-account,” economy and the state-controlled economy (including both state enterprises of the traditional sort and military-run ones in agriculture and tourism, as well as joint ventures in the foreign sector). However, there is little functional connection between these economic sectors: as already suggested, there is virtually no freelydevised economic intermediation, such as that which is provided by “middlemen” and suppliers, who are deemed “parasites” and legally prohibited. There is little or no subcontracting with the second or informal economy, again as a matter of legal proscription; nor, therefore, is it possible to create vertical integration through the myriad manufacturing, supply, or service networks that are commonly found in other transitional economies. Labor markets are similarly stunted, as distortions abound in the contracting of labor and in employment law. In the tourist and other foreign investment sectors, for instance, employment of Cuban nationals by foreign firms is from state-provided Party lists, while in the “own-account” sector, employment is putatively limited to family members, and entire categories of professionals and state functionaries are excluded from self-employment in various ways. The expediency, inconsistency, arbitrariness, and severity with which own-account economic activity is regulated represents a severe pull against the kind of economic relations that would allow the larger, staterun economy (especially in its foreign investment and tourism operations) and the second and informal economies to strengthen one another, literally to complement and inform one another. While market forces and values may appear pervasive, there is little real prospect for the autonomous development of markets, and less yet for a fundamental alteration of the state’s mode of intervention in the economy such as might allow functional integration across statecontrolled and partially-marketized sectors. That the Cuban leadership seems little concerned with the establishment of reliable procedural and substantive rules for either politics or commerce is consistent with the thesis that basic reform is unlikely. Periodic “rectifications” and the uncertainty they create also militate against liberalization and liberal-democratic values. Economic liberalization is not moving apace in Cuba, in the sense of fundamental and integrated restructuring of the economy in a market direction, and in the sense of institutional transformation in the direction of property rights and contract law regimes. The overweening exercise of political control in Cuba has tended to thwart the full development of essential market institutions such as commercial, property, and labor law, even to the limited extent that these have taken shape in China and Vietnam, which have served as models for the Cuban government. Coupled with American sanctions, this creates a climate of uncertainty that deters both foreign and domestic investment and inhibits entrepreneurial activity at all levels. There is a lack, therefore, of a complementary relation between institutions of the market, such as those permitting freedom to contract and to employ labor. The argument from institutional economics is that the interaction of institutions and firms is generated by the imperfections of markets, as these institutions provide the stable rules and protections that permit reliance on contracts and other commercial transactions, thereby reducing uncertainty and transaction costs. Institutional protections for commerce also permit the development of enduring economic strategies by firms and by inter-firm coalitions. Network analysis is gaining prominence in economics on the premise that it is precisely in circumstances of fundamental uncertainty that enterprises seek strategic alliances, conducting business cooperatively as well as competitively in pursuit of common goals, operating at the conjunction of the organizational and the personal. Such alliances are functionally interdependent, basing their operations on the control of activities, resources, and knowledge. Networks are defined structurally by actual and latent relations, and by their horizontal or vertical position across firms. Government can engage in coproduction activities with and otherwise support such networks, if it affords them enough autonomy. The development of autonomous networks in commerce is a requisite part of the institutional development of markets, i.e., of the emergence of institutions with a functional and dynamic interrelation to markets. In a similar vein, managerial networks can develop as managers’ interactions within or across sectors (e.g., tourism, trade, and shipping) settle into predictable, social-exchange forms of governance or coordination, which gain structural “embeddedness” in the course of complex exchanges under conditions of uncertainty. Network structures are characterized by an institutionality of process rather than hierarchy, particularly in a society and economy like Cuba’s, where there is little difference between managerial or interfirm relations and interpersonal relations. Cuba’s is a relational rather than individualistic culture (Earp, 1996) so that entrepreneurial and managerial nets consist mainly of interpersonal ties and reciprocal exchanges even when the institutions involved are well-developed. Network structures involve an identity type of relation, i.e., relationships where social status predominates, whether based on school or family ties, social or political standing, or provenance (e.g., coming from the same town or neighborhood). Cuba’s second economy is similarly based on cross-cutting family and social networks, and, if unfettered, it could provide a basis for the development and integration of markets in various sectors. The argument of the network literature is that institutional development based on the increasing embeddedness of process (of social resources and production and commercial transactions) is positive, on the assumption that network ties reduce transaction costs, noise, friction, and uncertainty in economic activity. Moreover, they do so without resorting to hierarchy or bureaucracy, so that the vitality of process supersedes the restraint of structure—a characteristic feature, incidentally, of informal economies. Social and human capital then become a function of brokerage activities, as key individuals (managers, entrepreneurs, middlemen, and other boundary-spanners) facilitate transactions on the basis of interpersonal ties, obligations, and tactical alliances. The economic value of networks is a function of their requisite complexity along with traits like flexibility and maneuverability. Transaction cost economics suggests that the cost of interorganizational transactions—which by definition “bridge” dyadic processes such as investment and allocation, production and marketing, and policy formulation and implementation—should be minimized, often by the choice of institutional frameworks and mechanisms through which the transactions are played out. The organizational form that is chosen is important, and no less important is the ability to test and select from a variety of institutional formations, since no one form is a priori best suited. One option is to incorporate transactions into a single firm, either literally or through various forms of vertical integration, including subcontracting. Another is a bilateral exchange relation between a pool of organizations and another, like a supplier, which enjoys singular economies of scale. Resort to contracts is typically costly, while transactions based largely on trust stand to be the least expensive, be they intrafirm arrangements based on internal processes and controls or interorganizational ones which exclude other actors because of exclusive access to assets or resources. Integration within a single firm is most predictable, since network partners may cease to act in the common interest if environmental conditions change unexpectedly. The magnitude of costs in transaction networks may be gauged by the “connection density” of critical elements of the collective project, by the degree of dependency among critical activities and activity sequences, by the frequency of these interactions, by the uncertainty involved, and by the exclusivity of access to vital assets. Such assets include not only fiscal resources but also technologies, business processes, and structured strategic opportunities which serve as incentives to keep organizational partners on board. The critical correlate is that certain institutional forms are deemed to be best suited to the minimization of costs, even though organizational actors may not be aware at the moment of engaging partners or of transacting business which form may work best in theory. It is through the lived experience of collaboration that the best institutional arrangements emerge and that norms of trust and fidelity come into play. 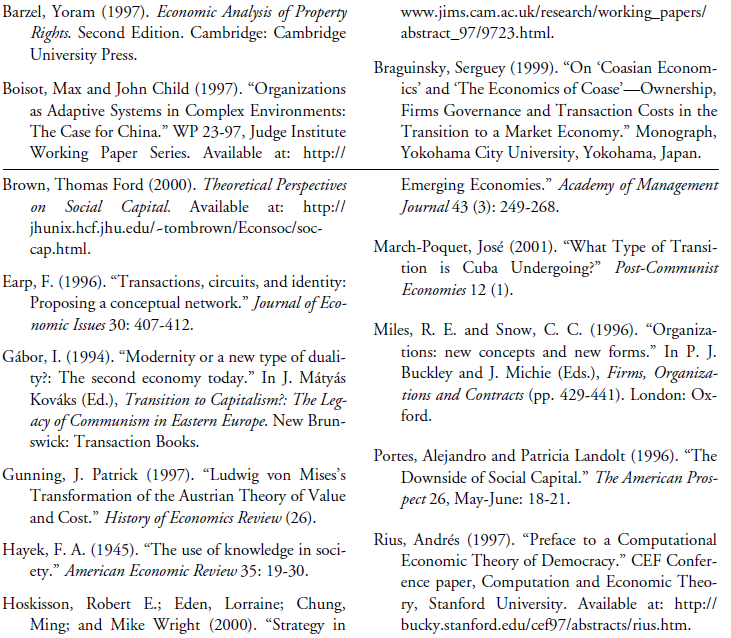 Transaction costs economics assumes that organizations or firms are able to experiment with different institutional formations, entering into specific ones at times of their own choosing, in a sequence chosen for maximal competitive advantage, with partners of their own predilection (Miles and Snow, 1996). There are some early signs of the development of more autonomous management practices in parastatal firms and in strategic partnerships with foreign investors in Cuba, given a move toward the liberalization and decentralization of trade relations and commerce, and it is here that one might look for managerial networks and inter-firm partnerships. It must be remarked, however, that while individual managers are given not only the freedom but also the responsibility to find business, especially with foreign partners, contracting and the fashioning of inter-firm arrangements still involves the scrutiny and approval or veto authority of state ministries, under legal dispositions that are subject to change at whim. While imports and exports were until recently entirely a matter of state control, now any manager of a tourist enterprise or one producing for export may make arrangements for commercial transactions directly, although these initiatives are often limited to the first investment or procurement decisions. It is in these endeavors that greater reliance on autonomous associations or partnerships among managers, suppliers, and investors may come to the fore, in inter- firm entrepreneurial networks. It must be noted once again, however, that what could be promising avenues for networking, specifically subcontracting and supply and service networks engaging the own account economy, continue to be prohibited in Cuba, and this reality renders Cuba an exception to the norm in both the “informal economy” and network economics literature. There continues to be in Cuba a sharp divide between the state-controlled economy and the own-account sector, with little communion between the two. Moreover, there is a great deal of collusive behavior and entrenchment of privilege among those positioned in the so-called “external sector,” and a high incidence of outright corruption in the insterstices of this sector. According to Hoskisson, et al. (2000), rent-seeking behavior by incumbents contributes to the maintenance of core rigidities in a transitional economy like Cuba’s. There is, therefore, a potential drawback to networks, in that players may collude to resist change, especially change in the formal and informal rules governing access to networks, in the absence of strong competitive pressures and reliable institutional restraints. In ascertaining the extent of economic liberalization in Cuba, it may be warranted to consider computer connectivity as an instance. Computer connectivity, including access to the Internet and World Wide Web, is often taken to be a critical factor in economic liberalization in Cuba and elsewhere. As this writer and coauthor Nelson Valdés indicated in “The Political Economy of the Internet in Cuba,” presented at the 1999 ASCE annual conference, Cuba is well connected to the Internet and Web, particularly with regard to the international projection of its products, tourism, and commercial scientific research, with numerous, often sophisticated websites. This effort is key to its attempts at reinsertion in the international economy. There is also great interest among Cubans in electronic mail and the Internet, and although there is rapid growth in domestic connectivity that might allow the development of electronic commerce, official access for individuals to the Internet is restricted in favor of connectivity for national research institutions, ministries, and commercial ventures. An example of the latter is Cubanet, which serves more than thirty joint-venture and tourism-oriented enterprises, offering them access to other commercial services abroad. Another example is Coral Container Lines— an enterprise involved in the shipping of containers to and from Cuba which operates an extensive private/ local network. Cuban banks serving domestic and international commerce have developed secure messaging and office transaction processing software packages, and bank automation has witnessed substantial increases in automation and internal networking, though not yet much external connectivity. The tourist sector has its own network administered by the Electronics for Tourism Group (Grupo de Electrónica para el Turismo), which serves all tourist chains in the country. The Islazul tourism chain, for example, is linking over forty of its hotels to the Internet. A complex of twenty schools of hotel operation and tourism across Cuba is networked by email. In Camagüey province, this network is part of a limited city network that channels electronic mail among a number of institutional users, including the school of tourism, the University of Camagüey, the medical school’s site for the national “Infomed” network, a sugar mill center, and a software company. In general, there is much more email connectivity across Cuba than Internet connections and access, but the island’s commercial presence on the Internet is impressive nonetheless, particularly in tourism. For example, the State tourism firm Cubanacán rents automobiles, the Gran Caribe hotel chain offers reservations, and Artex offers a website for compact discs of Cuban music all via the Internet. A stated aim of the Cuban government is to involve erstwhile Cuban entrepreneurs as well as state enterprises in international electronic commerce, by both encouraging interest in it as a novelty and rendering its use a more or less routine part of the marketing of Cuban enterprises. However, individual Internet accounts are still forbidden by law and only obtain through surreptitious access, including subrosa dealings with operators of state-approved institutional sites. Entrepreneurial efforts using the net are therefore a legal as well as practical impossibility, and there is little prospect for the use of information networks as links for commerce. The economic implications of the Internet—exactly how it will affect various markets or the uses to which it can be put—are only beginning to be understood. There is general agreement, however, that the Internet’s effects on markets and on job creation (and subtraction) will be enormous in both developed and developing nations, and that it can transform the modes and processes of production, contracting, and marketing wherever its commercial use is widespread. Two basic views of the Internet seem to dominate its discussion in the United States and Europe. On the one hand, it is understood physically as the connection among installed computers, allowing access to the information available on them. On the other hand, it is regarded spatially as a place or complex of places to frequent, for political, commercial, entertainment, and many other informational and communications purposes, tantamount in some treatments to a civic space and in others to a marketplace. Each concept carries its own assumptions about the economic role and possibilities of the Internet, and each has a particular set of political and public policy premises as well. In one instance, the role of information technology in the economy may be cast as that of a publicly regulated infrastructure, a public good that government provides and maintains. From the second perspective, it is a public arena, and the policy questions are in the main legal, having to do with jurisdiction and regulatory scope. In both cases, the institutional scaffolding of telecommunications and electronic commerce in policy, regulation, and law is of paramount importance. The Internet is thus cast as both a commercial and political space allowing considerable freedom of entry, transaction, collaboration, and discourse. What is not countenanced in these debates, oriented as they are to the realities of developed or emerging market economies, is a governmental position that would prohibit individual and entrepreneurial access to the Internet and Web. In Cuba, because of concern over propaganda and over “undesirable” cultural influences from abroad, individual accounts are forbidden— although they would be beyond the means of most ordinary citizens if in fact permitted. While parastatals and state-sanctioned commercial ventures generally have access to the Internet and Web, most electronic commerce opportunities which might arise from individual entrepreneurship are excluded. Therefore, just as there is evidence of repressed consumer demand in the economy, there are many indications of repressed demand for access to computing and to information networks. When the prospects for undesirable political influence through information networks are drastically reduced, the possibilities for commercial and political interaction through them are also dimmed. Ironically, there is then virtually no role left for the state in the active promotion and regulation of information networks toward these ends. Cuba’s military, though it has a prominent managerial role in the tourist sector through enterprises such as the firm Gaviota, is in a position to advance the cause of the country’s reinsertion in the global economy relying, in part, on international marketing efforts. However, its limited technical capacity in this area, along with conflicts inherent in its dual aims of national defense and economic development, have sidelined the military with respect to information policy. Military direction of manufacturing, commercial, and service sector, especially tourist, enterprises has relied on close circles of old-line (largely Sierra- era) friendships at the helm. The Armed Forces Ministry finds it difficult, prohibitively costly in both economic and political terms, to include nonmilitary managers and technocrats in their endeavors, or to go beyond the relatively static quality-control principles and mechanisms of their own managerial training (although, ironically enough, the FAR are transmitting their Total Quality Management and like practices to state enterprises through a much-vaunted program of “Perfeccionamiento Empresarial,” or “Managerial Improvement”). The requirement for political clearances in a context of erratic economic policy renders such dynamism impossible for the Cuban Armed Forces, notwithstanding their relative institutional depth and sophistication, or their success in managerial endeavors since the mid-eighties. It is a maxim of transaction costs economics that the larger the group, the lesser its rents and privileges, and the greater the costs of organization and reorganization. There are great practical difficulties involved for Cuban military officers engaged in the managerial control of manufacturing and service firms to open their administrative apparatus to other actors. However, the overriding obstacles are those of state control over the extent, pace, and manner of FAR economic activity. Whatever part of the Cuban economy one examines, there appears to be little cross-penetration of economic sectors and relatively little in the way of entrepreneurial initiative; in short, little evidence of a thoroughgoing transition to the market. An economic transition toward the market cannot occur without the development of autonomous and capable institutions, nor can it be sustained without the institutional capacity to combine and recombine in new organizational forms. The extent of articulation among economic actors, their combinatorial potential, and the freedom to align and realign strategically are the principal measures of marketization, for those national transitions in which the adaptation and readaptation of institutions is critical. Among emerging market economies, socialist countries undergoing transition have evidenced the greatest need for fundamental institutional changes. From an institutional perspective, economic development depends on integrative institutional linkages functioning in such a way that growth in one sector impels growth in other sectors. In Cuba, agriculture in recent years may have filled this generative role, through the dismantling of state farms and the developing of military-run farms as well as cooperatives. “Liberalization” of agriculture has proceeded in tandem with other, sometimes contradictory, economic and policy developments. As previously indicated, the Cuban government has promoted tourism, export, and foreign investment while severely limiting the development of (and access to) financial and information resources, and it has allowed military- and civilian-controlled managerial enterprises to advance in parallel but not through mutual engagement. Just as, in agriculture, farmer’s markets, cooperatives, and the military farms are kept isolated. The deliberate segmentation of the Cuban economy, along with the continual promulgation of new rules of the game for the owners of own-account enterprises (“cuentapropistas”), would appear to frustrate the stated goals of economic restructuring. The outcome is a kind of conditional openness akin to certain aspects of the Soviet transition of the late 1980s, and the prospects are no better (from a regime perspective) for the success of limited and inconsistent engagement with the global economy and polity. Political and economic institutions are systemic responses to failures in societal capacity to process information through rational decision processes. They are “stopping rules” or “stopping devices” which bind otherwise intractable information challenges. Boisot and Child (1997) treat institutions as adaptive systems which have to match and respond to the complexity of demands from their pertinent environment, and they do so through a number of reductive means which include abstraction and diffusion of information through organizational repertoires and standard procedures, through cross-coupling across institutional boundaries, and through codification mechanisms which include the regulatory function of government. The complexity-handling modes of action in institutions generally aim at complexity reduction— efforts to comprehend and act on complex demands on the institutional system—and complexity absorption, typically through the generation of decisional and strategic-action options, risk-hedging strategies, and through alliances, coalitions, and networks. These macrosocial regimes may: 1) determine the types and amounts of resources available … over time; 2) describe with whom actors may forge ties, thus bounding and structuring [actual and incipient networks]; 3) legitimate and regulate transactions; 4) construct and implement sanctions in response to violations of the [given] regulatory system; 5) describe and regulate social status within the network; 6) construct the motivations underlying network transactions; [and] 7) construct and regulate competition between different networks. These types of institutional embeddedness, Brown continues, are here framed with reference to a loop of macro-to-meso and macro-to-macro causation. Brown cites Portes and Landolt (1996) as suggesting that “networks whose membership is bounded by particularism can also constitute [what Adam Smith termed] conspiracies against the public, in that network resources are reserved to in-group members while access is denied to the general public (Brown, 2000, p. 10). Macro-to-micro causation can be traced to the ways that macrostructural regimes shape individual motivations for wealth, power, and opportunistic action, while meso-to-micro causal movement may be exemplified by the way that regulatory measures are devised protectively by elites in response to threats by rivals, often rivals acting through collusive networks. At any of these levels, or in any of the possible combinations of level-to-level causation, transaction costs, defined for our purposes as “the costs associated with the transfer, capture, and protection of [ownership]” (Barzel, 1997, p. 4) and, more generally, information costs and costs of exchange, increase proportionately with the increasing fixity of economic control regimes. In the Soviet case, it has been argued (Braguinsky, 1999, p. 3) that the collapse of the USSR, of the communist system, was largely caused by “the preceding collapse of hierarchical ownership rights.” The departure from totalitarianism in Russia “presents a case of an ‘entirely internal and spontaneous’ transition [due less to exogenous forces than to] … a large-scale transfer of de facto property rights (defined as residual control rights) [occurring] from the top political leadership and bureaucrats to coalitions comprised of [state-owned enterprise] management, middle-rank nomenklatura officials, and the barons of the so-called ‘parallel economy.’” In short, the insider- coalitions changed, and with them, in both the pre- and post-socialist transition periods, transaction costs increased dramatically, accounting in large part for the gross inefficiencies of the Russian economy. In the Cuban case, while there have been some shifts in institutional power (for instance, the ascendancy of the FAR over the Interior Ministry after the Ochoa affair, which presaged a crucial politico-economic role for the military, particularly in trade and tourism), market mechanisms have fallen far short of restructuring relations around control rights as here defined. While functioning networks are assumed to reduce transaction costs by means of trust, with social sanctions that reduce the gains than may be gleaned from opportunistic behavior, the struggle between insiders and outsiders, or conflictive transfer of de-facto property rights from one group or coalition to another, is usually very costly in exchange costs measures. Moreover, after such transfers of power, the new insiders must operate without the benefit of previously extant mechanisms of control, including both formal and informal mechanisms of regulatory control. Again, this is the case in Russia today. Such transitions are characterized by very high information and transaction costs until the development or reconfiguration of institutional regimes consistent with (favoring) new elite coalitions. In the Cuban case, however, there is little evidence of even this flawed kind of transfer of control rights or of any fundamental economic shift toward the market. March-Poquet (2000) suggests areas of Cuba’s economic transition where research could seek promising structural linkages between sectors. One is the functioning of the UBPCs—Basic Units of Cooperating Production—in agriculture which, if allowed “to overcome the operational [and regulatory] handicaps that limit their production growth, [could render rationing] unnecessary,” and which, “with the current farming markets would generate an articulated food market nationally” (p. 105). However, he adds, such an articulation does not obtain yet. Other possibilities include linkages between dollar-only retail outlets and Cuban domestic producers of goods (rather than just imported goods), or between cuentapropista craft producers and sellers and their state counterparts. March-Poquet reports recent evidence that some economic intermediation may be allowed (though by state-owned companies), and specifically that the development of direct contracts between companies is to be promoted in a way that will enable them to agree [to] the terms for the exchange of goods and services freely. The intention has also been announced to develop a business sector to act as an intermediary in trade. … The increase in the number of intermediate distribution companies trading raw materials and equipment, together with greater freedom [for] company supply policy, could be the origin of a future domestic market in intermediate goods and services (p.105). March-Poquet concludes that in these areas of possible transition and in others (including free trade zones, telecommunications investments, the evolution of a quasi-private-ownership model in foreign direct investment generally) “… attempts are at an early stage and assessing their potential scope is risky” (p. 105). The dualities of controlled and relatively marketized elements of the economy seem much more entrenched than they were in the former Soviet Union before its collapse in 1991, or in the countries of Eastern Europe now undergoing postsocialist transitions. Other, more strictly political obstacles have been noted by other commentators, including this writer’s earlier published research on Cuba: notably, the absence of civil institutions with any real autonomy, the absence of a political culture of democratic tolerance, and the absence of “social capital” on the basis of trust and reciprocity. It would appear that the depth of the Cuban transition has been overestimated by many analysts and commentators, largely because the premise of dynamic interaction, of causal linkage, between the state-controlled and market-oriented sectors of the economy has yet to be empirically justified. Future research building on this study will incorporate consideration of advances in information theory that may shed light on the requirements for a market transition out of socialism, in view of the informational complexity of market interactions. It is anticipated that the Austrian economists, especially Mises and Hayek, will help make sense of the issues of information- generation and the use of knowledge in market systems, and therefore help elucidate the obstacles to marketization in the Cuban case. Of particular interest will be the problems associated with the generation of market information when economic sectors are both insufficiently autonomous and insufficiently integrated. Gunning (1997) describes how Ludwig von Mises might have traced costs for an entrepreneur from a particular market for a first-order good to markets for higher-order goods in a way that highlights information processes and subjective valuations. The cost of producing a consumer good is seen to consist largely of the prices of the marketable factors of production needed to produce the good. In market economies, prices for these factors of production are set in factor markets through competitive bidding by entrepreneurs. Entrepreneurs are willing to marginally outbid each other when they anticipate that the object factor— labor, inputs, or finished goods—when combined with other, complementary factors, could earn them a profit. The net effect is prototypical of competitive markets: factors become available in supplies sufficient to meet demand, which lowers costs, while competitive bidding raises factor prices selectively, making for greater adequacy in compensation for labor and other factors of production. If one entrepreneur wishes to gain control of a factor, such as labor, now used by another, the cost of that factor will rise beyond marginal-utility calculations on the basis of the subjective valuations of the entrepreneur bidding for it, on considerations of its complementarity with other factors of production—for instance, the value of an experienced webmaster to an enterprise wishing to project itself onto the Internet. Economic agents must closely follow changes in factor prices, and their opportunistic actions in processing and acting upon their assessments of market signals in turn alter those markets. They are processors and generators of information while altering, often in the positive directions just described, the operation of factor markets. However, the salutary effects of bidding in factor markets obviously presuppose the existence of both entrepreneurs and factor markets, as well as their operation across firms and across economic sectors. Neither of these conditions obtains in Cuba, and therefore synergies across markets are absent as well. Economic initiative and factors of production are constrained within state-determined boundaries, such as those delimiting the military-run tourist, manufacturing, and agricultural sector, the sui generis rules binding the foreign investment and own-account sectors respectively, and range and character of control rights pertaining to each economic sector. Additionally, there can be no independent middlemen or suppliers in the distribution of intermediary goods or finished products, nor labor markets cutting across sectors, precluding therefore the emergence of agents as appraisers and makers of prices and costs. The synchronizing or coordinating role of intermediary agents operating in factor markets is therefore precluded, and the segmentation, isolation, and divergent development of markets, such as they are, continues apace. This concluding discussion may recall Hayek’s critique of socialist central planning. For Hayek, the question was “whether planning is to be done centrally, by one authority for the whole economic system,” or effected by “many separate persons” on the basis of local information and local knowledge as individuals strive “to fit their plans in with those of others” (Hayek, 1945, p. 521). This perspective implicates the middlemen and brokers whose economic role in large part is to determine which factors of production are undervalued or underutilized. It also argues for the development and integration of markets for the sake of a more targeted and effective use of all of the material and human resources of society.